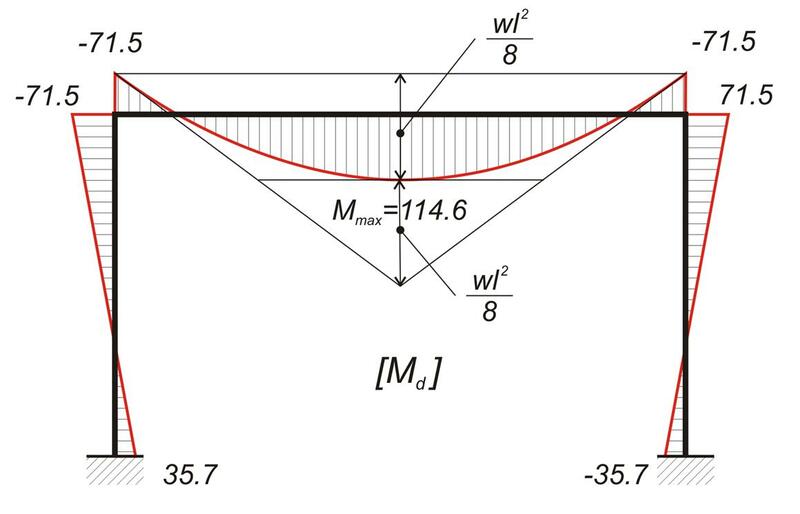 For both frames of the above structure, the calculation of the stress resultants subjected to static loads (dead and live) and seismic loads is required. 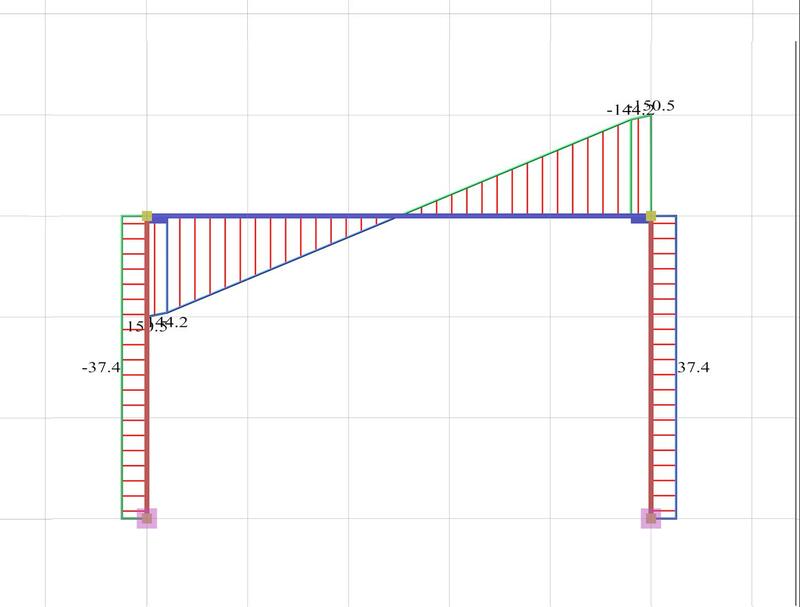 Each frame has a span of 5.0 m and a height of 3.0 m. The moment of inertia of each column bar is I=0.4x0.43/12=0.0021333 m4=21.33x10-4m4. beff=min(bw+beff,1, blim)=min(0.30+0.70, 2.15)=1.00 m, since beff,1=min(0.20·b 1+0.10·lo , 0.20·lo)= min(0.20x1.85+0.10x3.50, 0.20x3.50)=min(0.72 , 0.70)=0.70 m.
From table 2 beff=1.0 m, hf/h=0.17/0.50=0.34, bw/beff=0.30 → μ=0.0417 → I=0.0417x1.0x0.503=52.125x10 -4 m4. 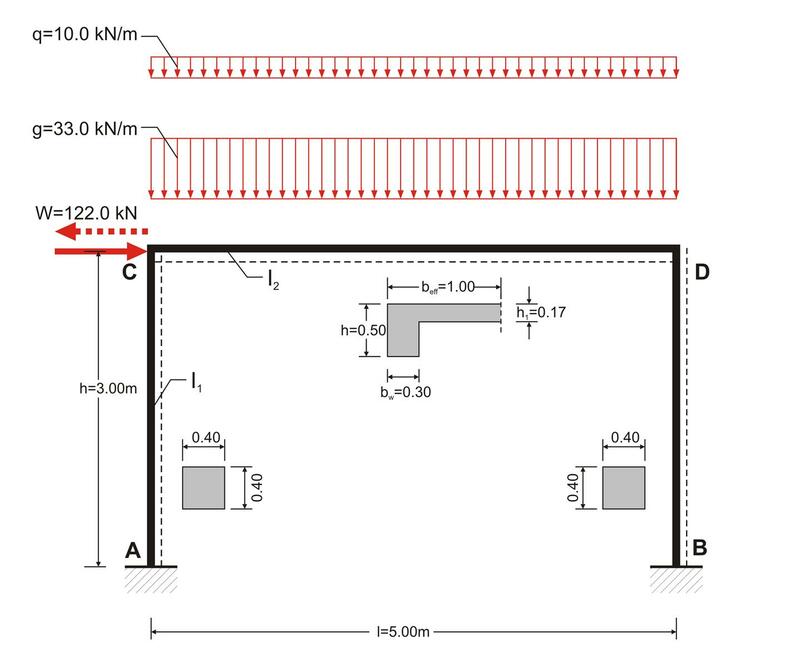 According to [EC8, §4.3.1(6),(7)] the stiffnesses of structural elements (beams, columns, walls) are considered as the 50% of their respective elastic ones due to cracking. 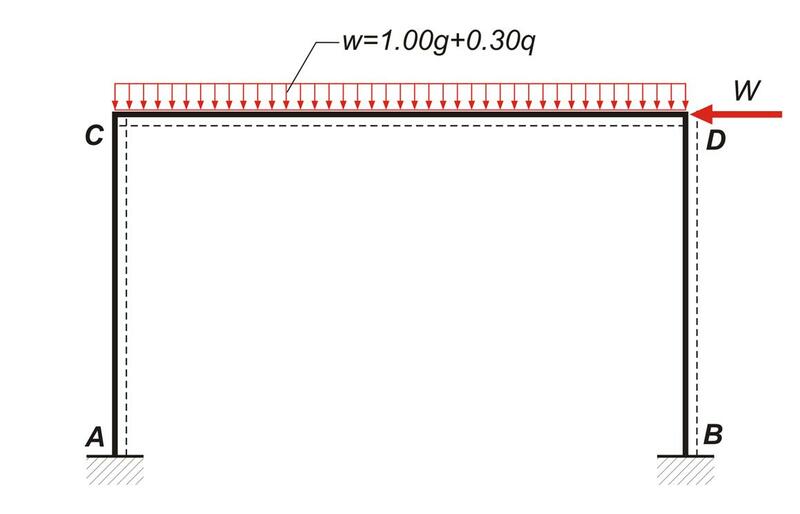 Provided that stiffnesses of all structural elements are reduced by the same factor, the stress resultants are equal to those of the elastic analysis (i.e. 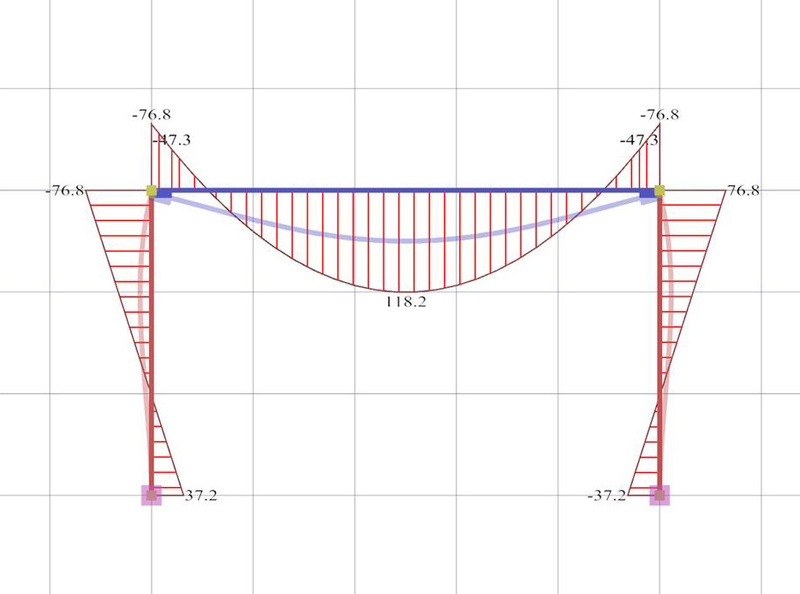 of full stiffnesses). 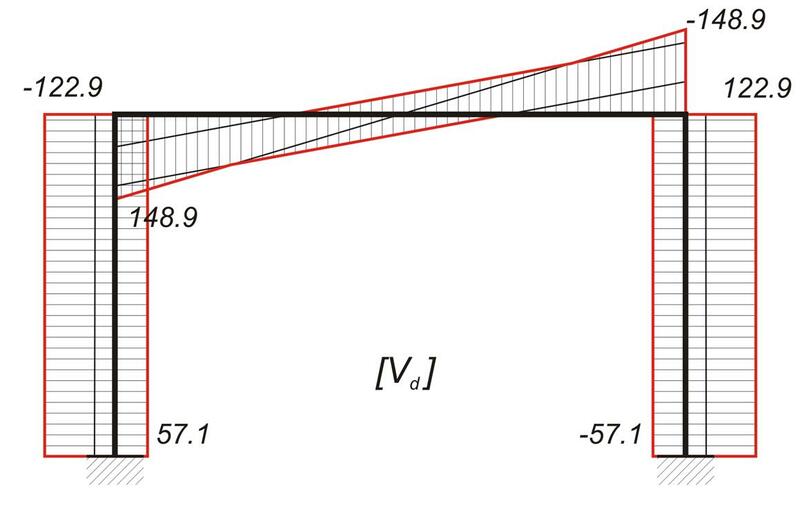 However the deformations of cracked elements are equal to 50% of the respective elastic deformations. 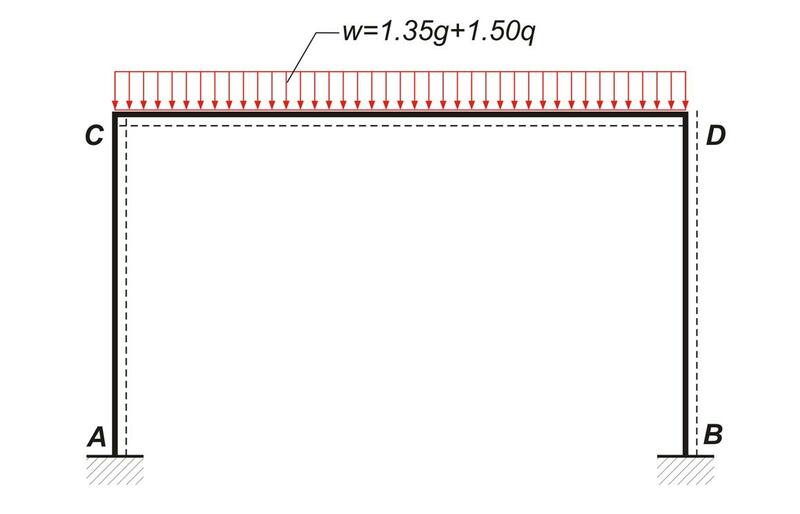 Τhe self-weight of each column is 0.40x0.40x3.00x25.00=12.00 kN. 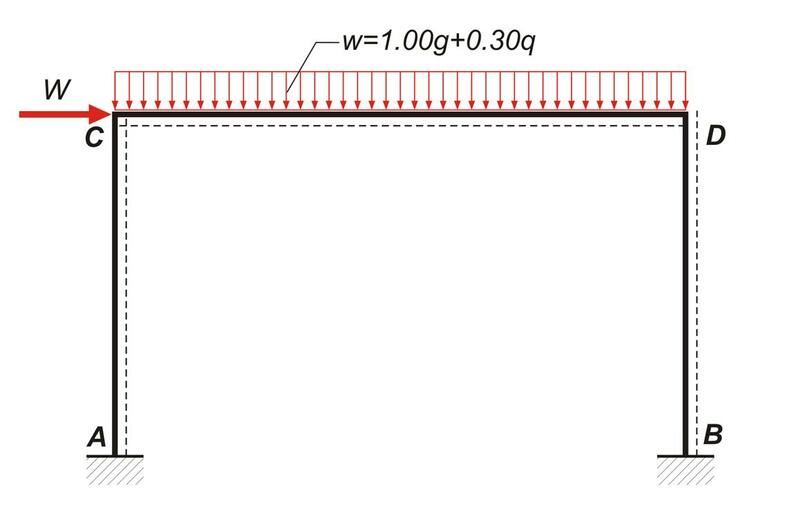 Τhe 1/3 of this load (4.00 kN) is applied on the column head and the rest 2/3 of the load (8.00 kN), are applied on the column base. 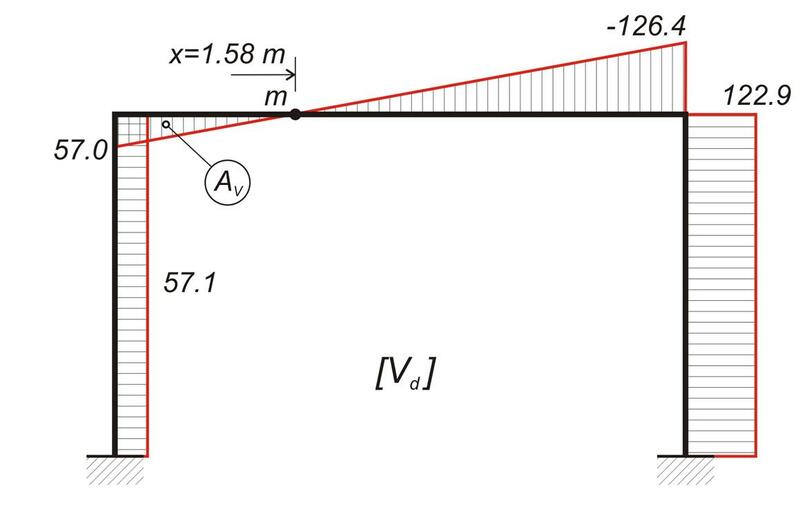 while the seismic force applied on each crossbar is W= (ax /g)·Pd=0.65x188.00=122.00 kN. 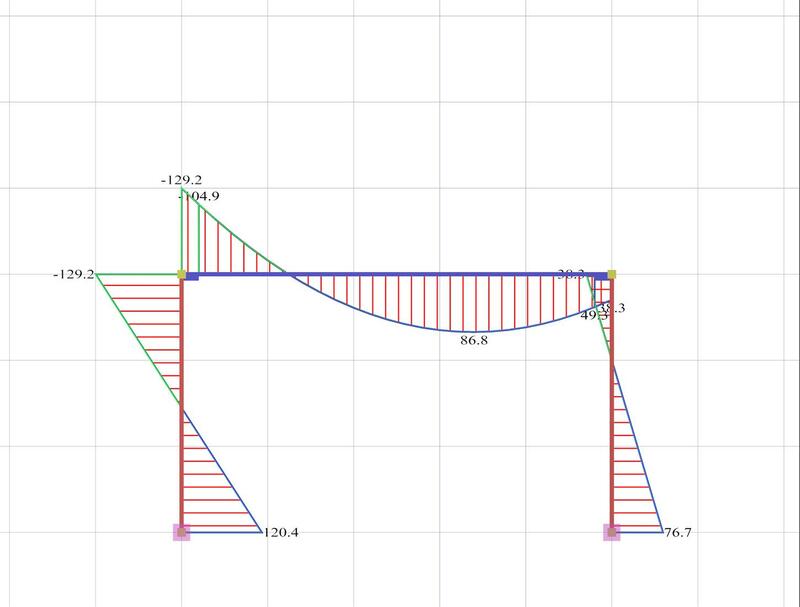 In the following analyses implemented manually, the function of rigid bodies will not be considered. 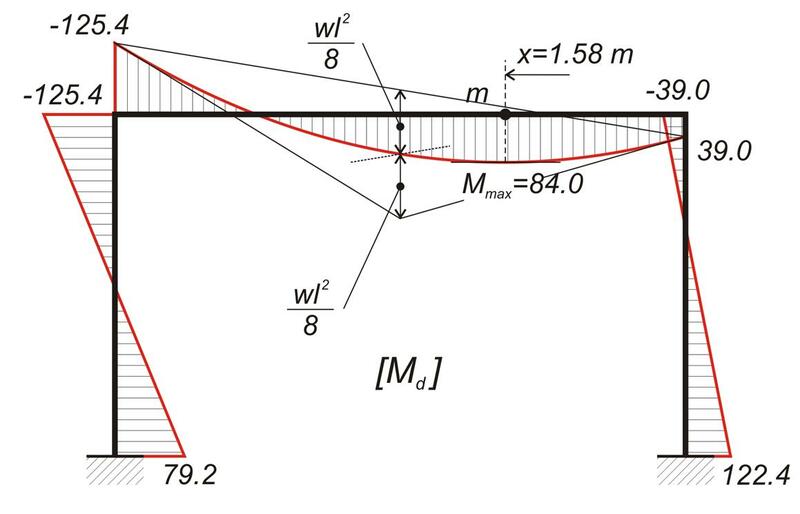 In each frame three analyses are performed, one for dead loads G, one for live loads Q and one for seismic loads in +X direction. 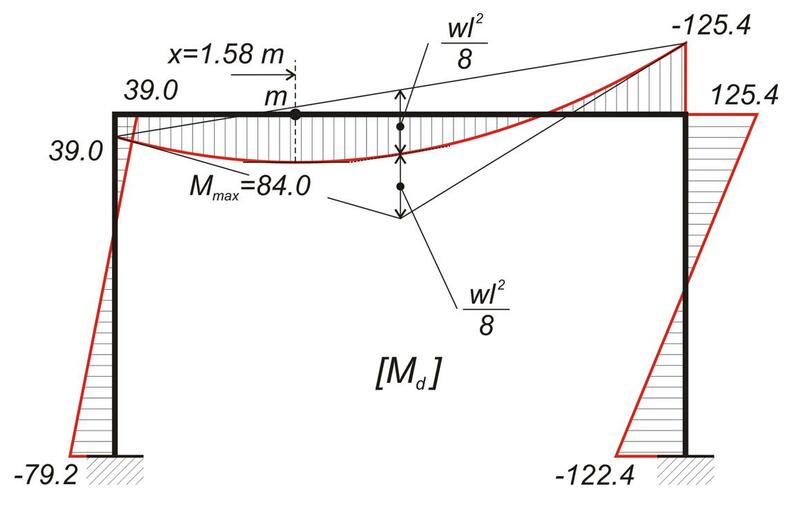 The actions examined previously will be used for the calculation (a) of combinations of actions without seismic loads according to §2.3.1 and (b) of the combination of actions with seismic loads according to §2.3.2. 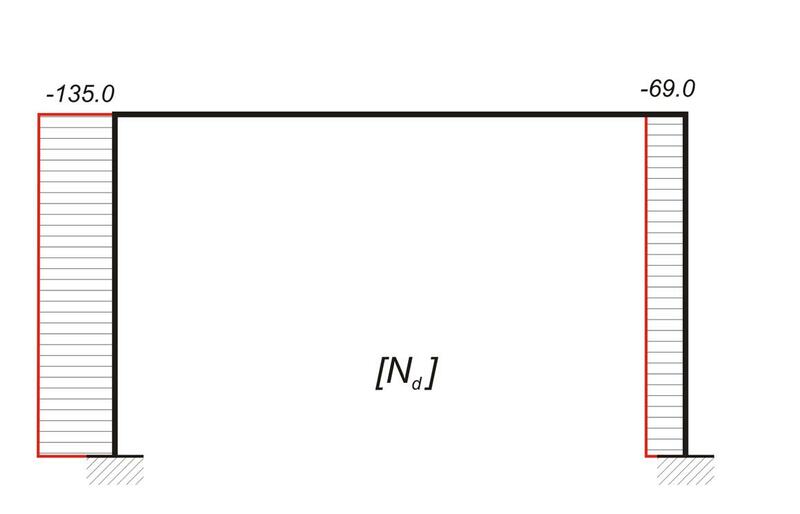 2nd combination: G+ ψ2·Q + "Εx" [*] NoteThe results of earthquake acting in x direction is symbolized as Ex?. 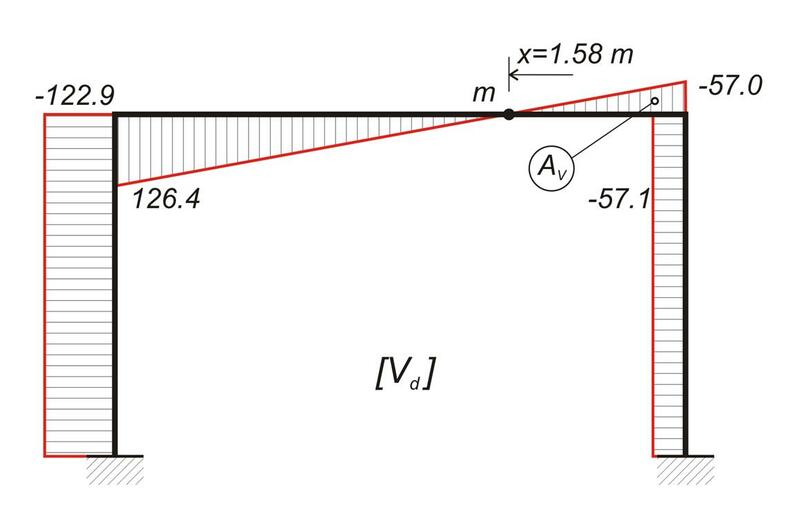 In general, there are components resulted in both x and y directions. 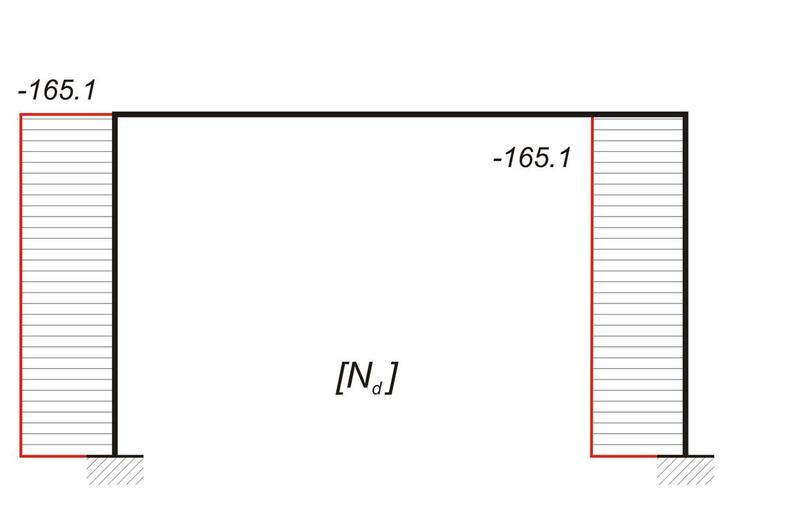 In this example, the results are only in x direction. 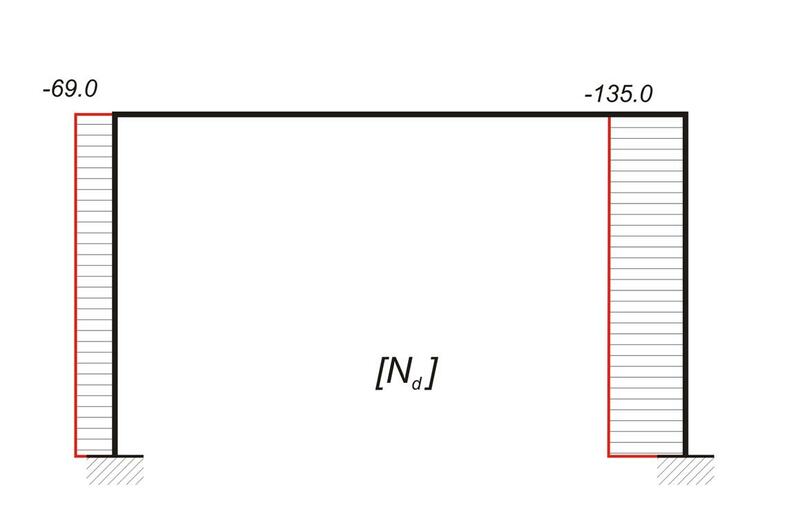 3rd combination: G+ ψ2·Q - "Εx"
In this example ψ2=0.30 based on paragraph §2.2.3.4, γg=1.35 and γq=1.50. Therefore the combinations are expressed as follows. 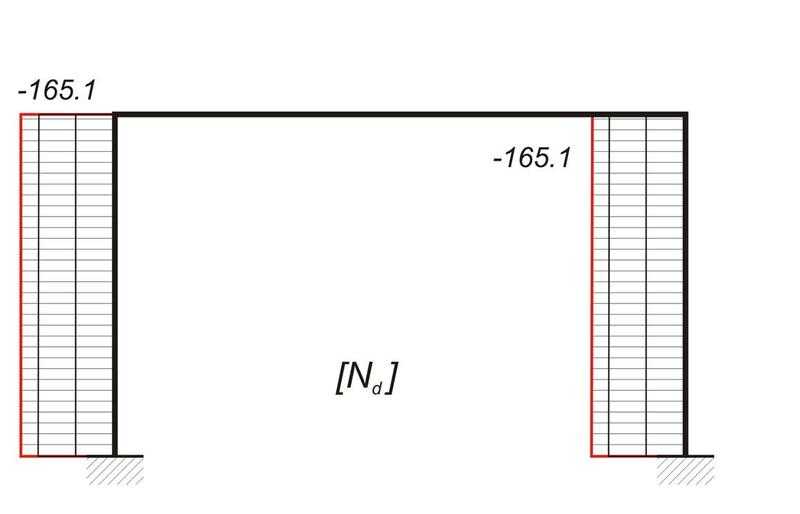 VDC=VCD-w·l=148.9 -59.55x5.0=-148.9 kN [*] NoteThis stress resultant, as well as most of the following, could be calculated by the simple observation of the symmetry both of structure and loading. However this general process is handling asymmetries as well, e.g. as in the 2nd loading. 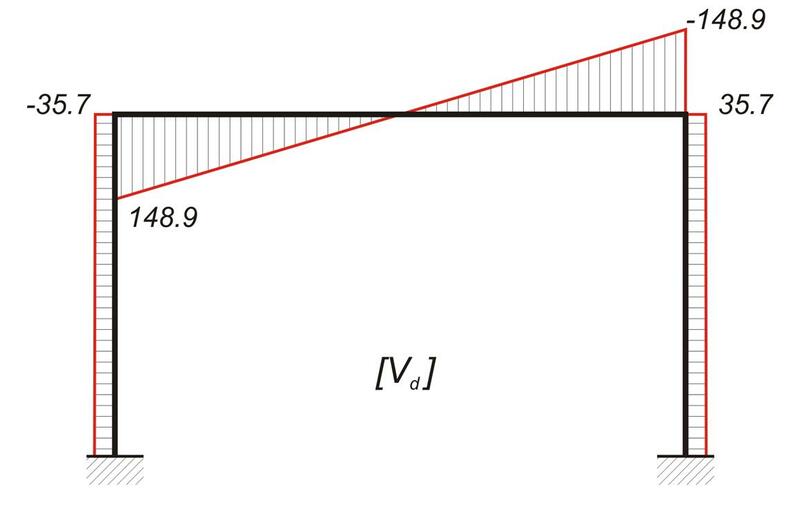 2nd combination : w=g + 0.30 · q + "Εx"=33.0+0.30x10.0 + "Ex"=36.0 kN/m + "Ex"
3rd combination : w=g + 0.30·q - "Ε x "=33.0+0.30x10.0 - "Ex"=36.0 kN/m - "Ex"
The values of stress resultants are mirror values of those of 2nd combination. The moments and shears of the slab are displayed by pressing the corresponding buttons on the left of the screen. The results are the same with the theoretical results of the analysis of the previous paragraph. 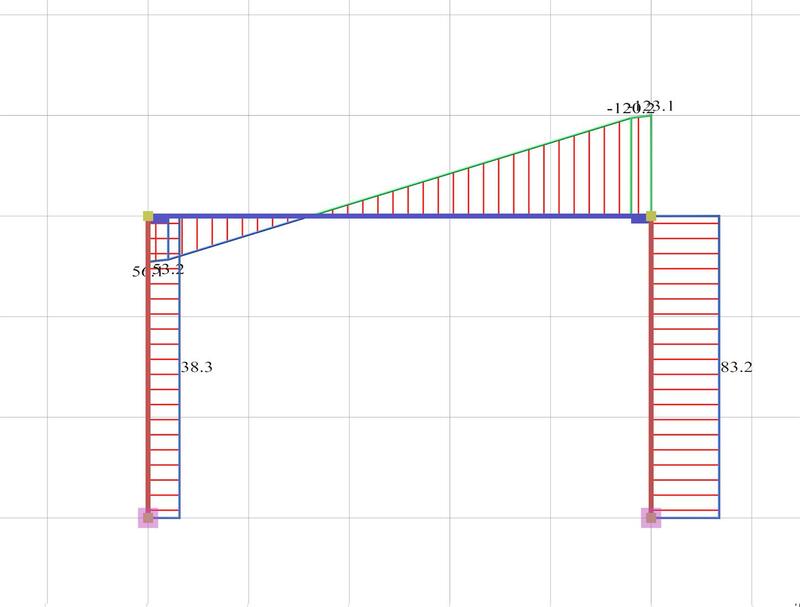 The model of the structure, created by the software, consists of bars, located on the centroidal axes of the columns and on the central axes at the top faces of the beams. 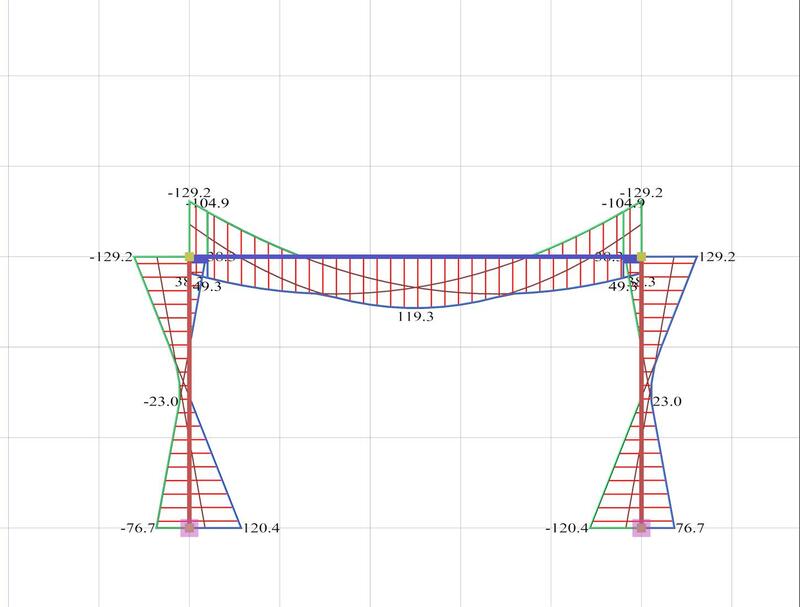 The column-to-beam connections are modelled by rigid bodies, placed along the direction of beams. 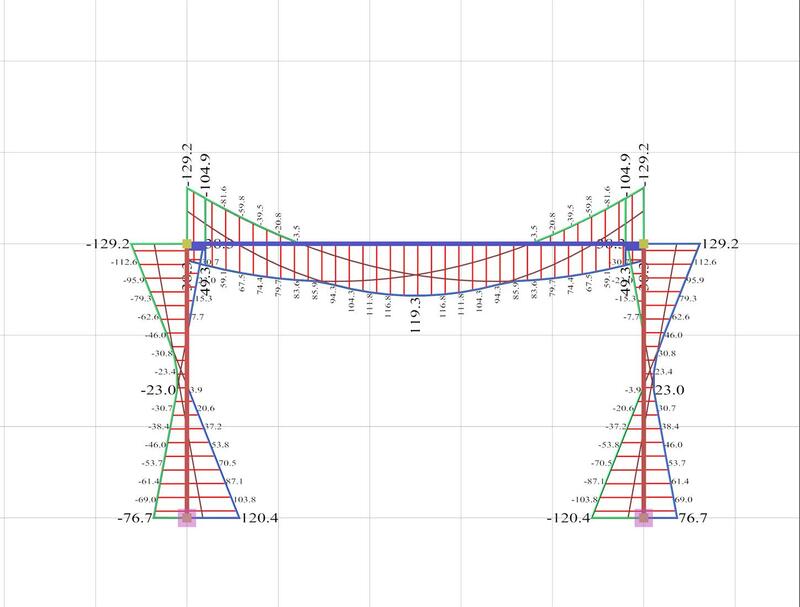 The diaphragm of the slab connects the two frames. The Interface allows the user to see the numbering of master and slave nodes. Moreover the user can select a node, or a bar and retrieve their geometrical and loading data. Most of their properties can be modified by selecting 'Properties' from the menu [*] NoteThe file, frame.sfd (which can be modified optionally by the user) contains the values of the interface passed to the solver. 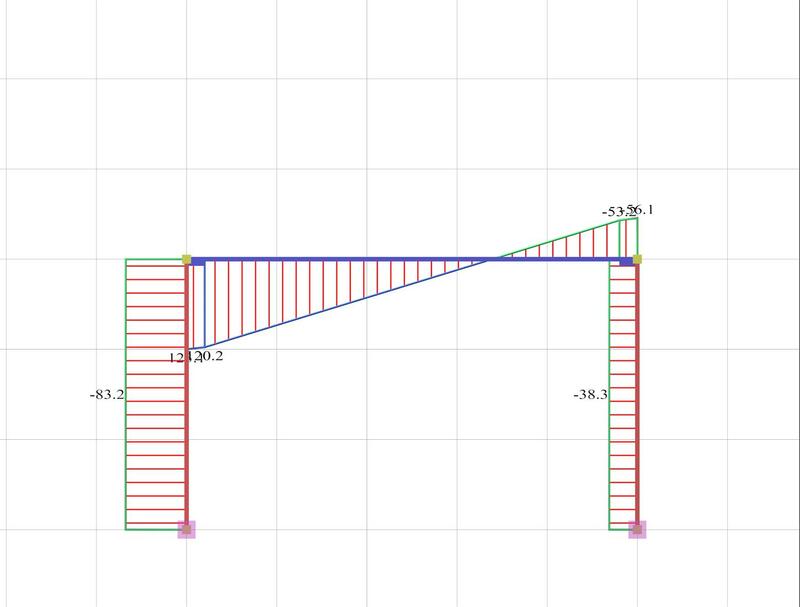 Τhe software displays the effective area of the slab on each frame, the total dead linear load g=34.5 kN/m and the total live linear load q=10.8 kN/m. 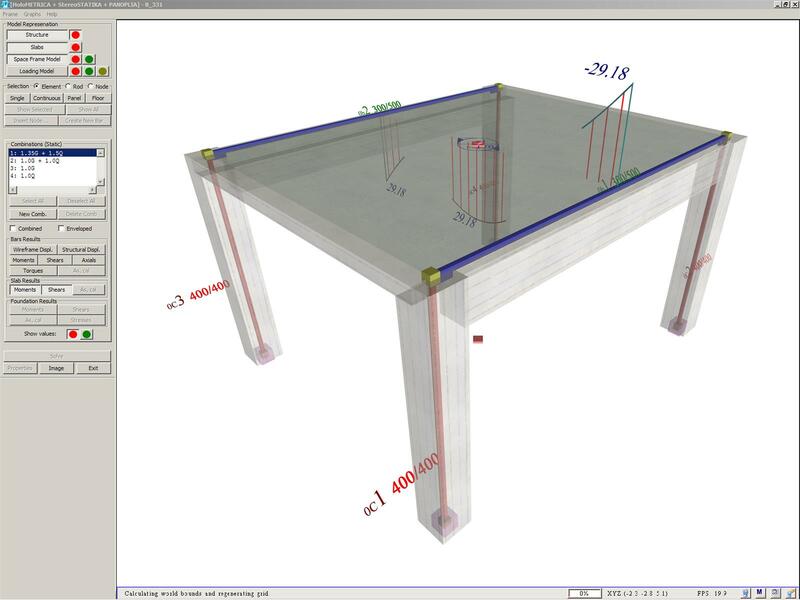 The slightly augmented values of g and q used by the software are due to corrections made for taking into account the slab loads that extend beyond both frame ends. 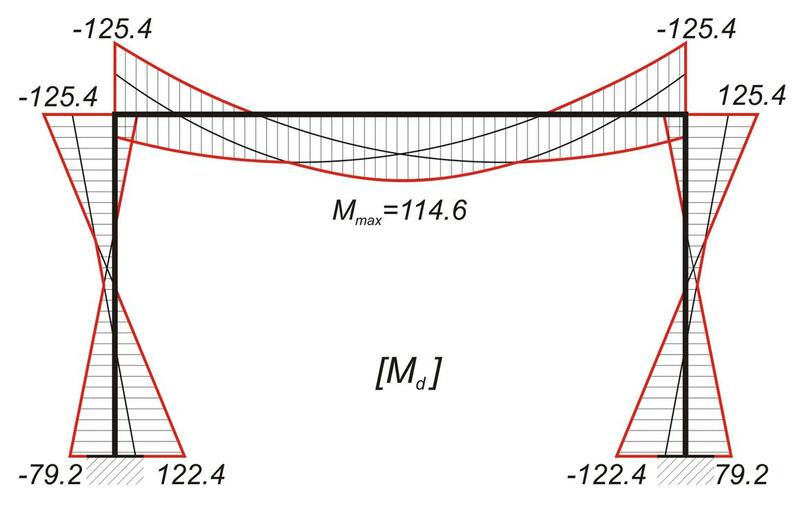 Τhe results of the three combinations from the software are given in the following diagrams of bending moments and shear forces (the elastic line is also shown). 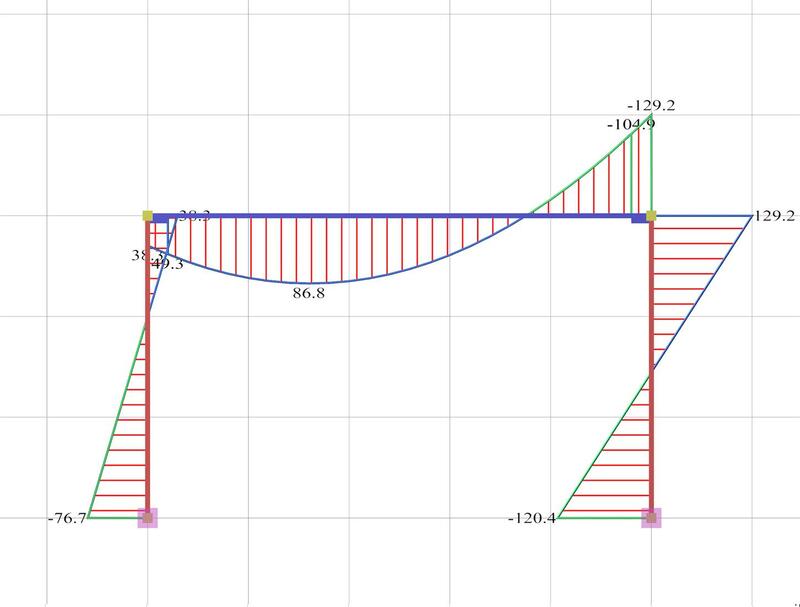 The small discrepancies between practical and automatic (via the software) calculations are due to the fact that the software uses rigid bodies and takes into account work done by shears and axial forces.